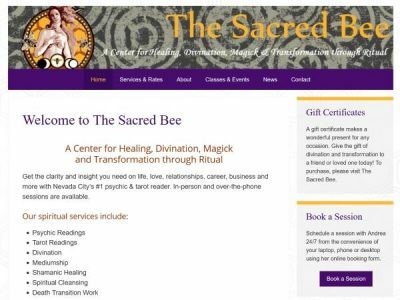 It was way back in February of 2011 that SierraHosts converted The Sacred Bee’s website from plain old static HTML & PHP to the dynamic and powerful WordPress content management system. Today, we’re happy to announce that “The Bee” is now mobile-friendly and a whole lot faster. See how the site when viewed on mobile doesn’t resize to fit the screen? 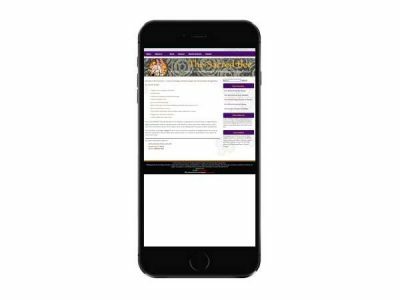 Some phones would show the page full-height but cut the right-hand side of the page off, forcing the viewer to scroll side-to-side. Both were resulting in a sub-par user experience (UX) that was causing visitors to bounce away from the site. Back in 2011, mobile devices weren’t much of a consideration for web design. But they are today. And it’s about a lot more than looking nice on various types of devices. According to Statista, mobile devices in 2018 account for more than 52% of all web traffic generated worldwide. 53% of mobile website visits are abandoned if a mobile site takes longer than three seconds to load according to Google’s most recent study. And when you also consider the fact that 55% of online searches are done on mobile devices, it’s not hard to understand why having a website that looks great and performs fast on mobile phones, tablets and desktops is absolutely critical for every small business. Failing to understand the importance of mobile — and optimize the website accordingly — can make the difference between boom and bust for any small business. 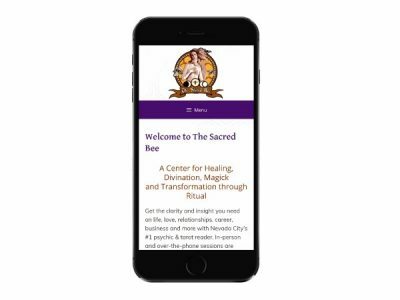 All of these considerations were the main drivers behind The Sacred Bee’s push to advance into the mobile era with a faster, mobile-responsive website that could drive traffic and additional sales. Our first goal was to swap “The Bee’s” non-responsive theme to a fully-responsive WordPress theme using the free and highly flexible GeneratePress theme. We love this theme because it’s easy to use, lightweight (fast), and coded for optimal SEO results. Next, the site’s typography was improved to make it easier to read on all devices. This was accomplished using the Typography module included in the GeneratePress Premium plugin — a huge time-saver! Much more readable, isn’t it? Then some tweaks to the page copy, keyword research, and a bit of on-site SEO optimization was done to improve site traffic and conversions. For an additional boost on conversions, all the phone numbers on the site were converted to ‘Click-to-call‘ — making it super easy for mobile visitors to place a call right away. After that, the blog page layout was improved to give it a more modern, masonry type of look that’s very popular on Pinterest and many blogging sites. To improve website security, the site was moved onto https using a free Let’s Encrypt SSL certificate (available to all SiteGround hosting accounts) and a security plugin was added for firewall, brute force and login protection. Unfortunately, we forgot to grab a screenshot of the ‘before’ Pingdom test, but it was clocking in at about 6 seconds which was totally unacceptable. While we didn’t look into the details as to why it was so slow, the old, out-of-date theme was probably the #1 culprit because so few plugins were installed on the site. Finally, adding the the business’ 5-star reviews from Google made for a very nice topping on the conversion side of the cake. The review plugin did add a bit of overhead to the site’s page speed, but considering the home page still clocks in at a blazing 930 milliseconds, the conversion benefits that such social proof offers is well worth it. Now that the revamped, mobile-friendly version of the site has launched and it’s sitemap has been submitted to the major search engines for indexing, all we need to do is wait to see how the site improves on it’s search engine visibility and conversions, which can easily be done through a combination of Google Analytics, Google Search Console data, and some custom keyword rank tracking reporting. It can take Google several days to index a new sitemap, and the organic keyword rankings won’t settle out for about 60-90 days. 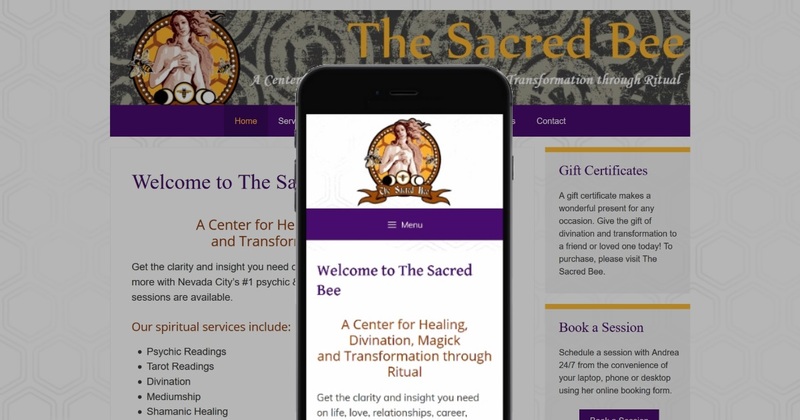 While there are future plans to improve this site to make it more profitable over the long term (including a complete re-design), for now, these simple mobile optimizations should do wonders to improve The Sacred Bee’s traffic and conversions. All-in-all, the entire process took just couple days and a few hundred dollars to complete; an investment that will be worth many multiples of the project cost over the lifetime of this website. Keep in mind that if you’re inexperienced with WordPress and plan to do this yourself, it’s going to take a lot longer (and time is worth money). But if your site is on Wix, Weebly or Squarespace… fuggeddaboudit! 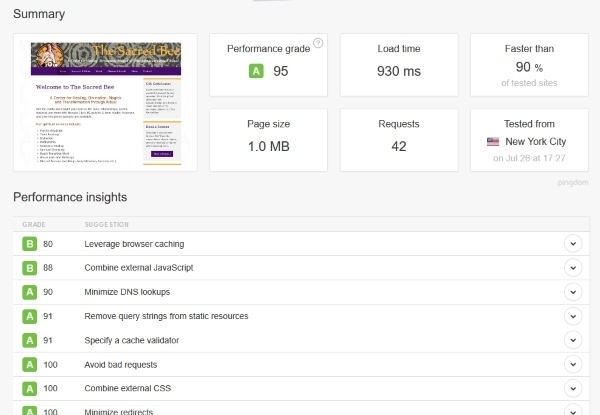 Beyond their mobile-responsive themes, these types of advanced performance optimizations are only available for self-hosted WordPress sites. And by the way, if you’re serious about your business success and happen to be using those above-mentioned rent-a-sites, you really do need to get your site moved onto WordPress ASAP. Find out if your website is a total turn-off for your mobile visitors by taking this free mobile-friendly test by Google. So, now that you know about the real costs of slow, non-mobile-friendly website, ask yourself how much money you’re leaving on the table with your existing website? And consider: what are your local competitors doing to out-pace you? Will your business get left in the dust, or will you make a decision right now to rocket into the modern, mobile age? When you’re ready to level up your website, get in touch.